“And the Love Is Free” PRINT Book is…. √ A collection of stories and reliable no-fuss family recipes. 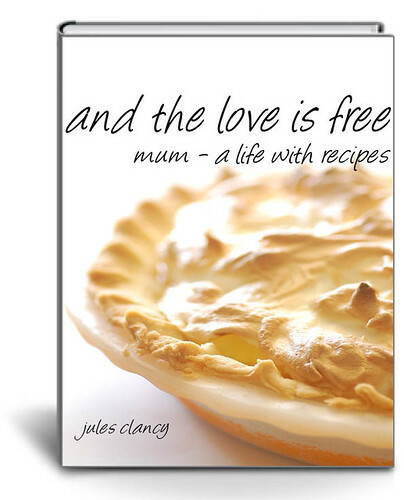 √ Packed with classic, tried and tested Australian recipes from pavlova to lamb roast. √ A one-stop reference for anyone who wants to learn about traditional Australian cooking. √ Perfect resource for beginner cooks and home leavers with all the basic reliable family recipes in one place. √ PLUS! Makes a lovely gift to treasure your Mum and make the most of the time you have together. 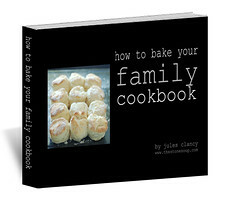 √ The quickest, easiest way to create your own professional, personalized family cookbook. √ How to stop procrastinating and tackle your cookbook project. to order your print book. HURRY! Only a limited number print books available. Once they’re gone, there won’t be another print run. NOTE: At the checkout you can choose ‘gift option‘ to include a message if sending the book as a gift. Choose ‘Note to Seller‘ if the shipping address for the gift is different from your own. If you aren’t happy with your print book, just email me [jules@thestonesoup.com]. You’ll get a 100% full, prompt and friendly refund. We part as friends. No questions asked. All the risk is on me. You have absolutely nothing to lose.